The constitution has nothing to do with the ratio of worker to boss. Lets hope it never does. If you look back at most of the revolutions since ours, they have had to do with ideology, and/or oppression. Often they are started by people who a pretty naive and have no plan for the after revolution government. Most end in more oppression. The communist revolutions of various countries are good examples. People thought they were going to get what others had. It would be "fair". They got oppression and more misery. We don't need a new constitution. We need the one we have to be followed. followed as it was written, rather than how it is constantly re interpreted. oppression comes when the middle classes start kicking up. I think you confuse the causes of revolution with the guys who then surface once it gets going. Idealogy needs the fuel of discontent. 1940, 1950 cuba - water shortages. History repeats, why would the U.S. be immune? If they increased energy bill for your home by a factor of 4.5 would you consider that cruel? If so why are you doing that to your bees? Your wealthy classes and the middle classes are disconnecting as the plutocrats weath increase yet their proportion of the tax burden decreases while more rests on the middle classes. This is a popular notion, but not true. the top 25% of earners in this country pay 85+ percent of the tax. the bottom 50% pays between 0 and 3% of the tax, and much of what they pay, they get back, some getting back more than they paid in. It is true that the rich are making more, but that has nothing to do with anything. In this country, it is not true that if someone makes more, someone else makes less. The pool of money is not static. The biggest problem we have right now is that the economy is stagnant. That has more to do with policies of the government, than with anything to do with business. The US is not immune to unrest, but if it comes to a civil war now it would not be because some people are making to much money. It would be to preserve our union and our constitution, which the current administration uses as toilet paper. redistribution to pacify the masses never works. A good economy in which everyone has a shot at doing well, always works. Actually, according to a study by the nonpartisan Tax Policy Center, as reported by CNBC, the top 1% of wage earners will pay 45.7% of individual income taxes in 2014. How do people who pay little or no taxes feel entitled to complain about the 1%? Easy: they feel entitled to complain about anything and everything. The real question is why those in power join them in complaining about "millionaires and billionaires" when they know that when they leave office they, like Bill Clinton, will reap millions just for giving speeches. Whipping up class envy gets votes for Democrats, but when the revolution comes and the masses start shedding blood, rich Democrats will be just as subject to the guillotine as rich Republicans. Blood lust is a terrible thing to see and I hope people tone down the rhetoric before they stir up more trouble than they can handle. Is that kind of trouble comes I think it will be coming from our new immigrants who came here for a better kind of socialism and didn't get it. I think some people like to focus on income to deflect attention from the real issue, wealth. but again, so what? The only reason wealth would make a difference is if the pot of money was limited. It is not, and even less so in a good economy. We'd hardly want to be without wealthy people. they are the founders of charitable groups, they hire people, they buy stuff. They are generally good for the economy and especially when the rest of us can't afford to do any of those things. The wealthy to acquire more when times are hard for the rest of us, but again, so what? That is a good chart. Now make up that same chart for every other country in the world and then compare it to our chart and I think you would be amazed by the comparison. Kathy, "So what?" is the correct answer to everything. If a person is wealthy, so what? If a person is gay, so what? If he/she is racist, so what? If whatever-you-can-imagine, so what? Philosophically, nobody owes anyone else more than that they mind their own business and not try to mind the next guy's business. So what? Good question actually, even if it wasn't meant to be. Wealth(actually Resources) is however limited. Land, as Henry George points out is the most important and absolutely limited. Place one hundred men on an island from which there is no escape, and whether you make one of these men the absolute owner of the other ninety-nine, or the absolute owner of the soil of the island, will make no difference either to him or to them. In the one case, as the other, the one will be the absolute master of the ninety-nine; His power extending even to life and death, for simply to refuse them permission to live upon the island would be to force them into the sea. See the relation? 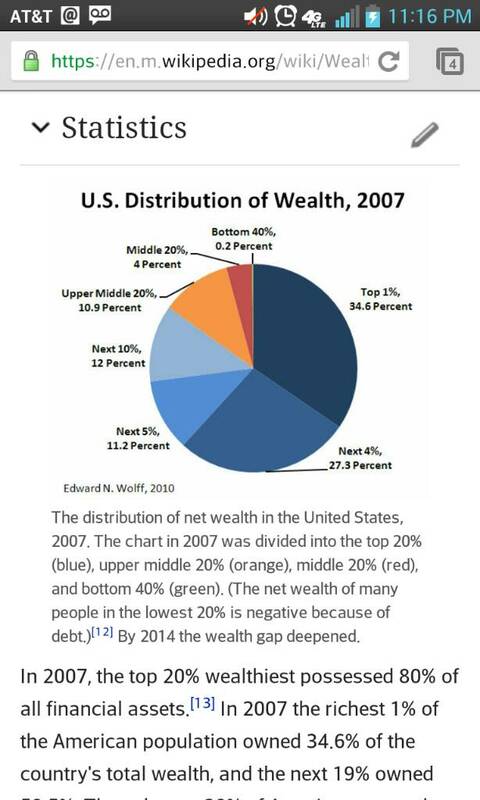 The more wealth concentrates into a smaller percentage the closer we move to being on that island. Do I want governments to confiscate that wealth and dole it out as they see fit? Are you crazy? My favorite quote comes straight from the gospel. See if you can guess what it is.